Does the Word Phenomenology Mean Anything to You? 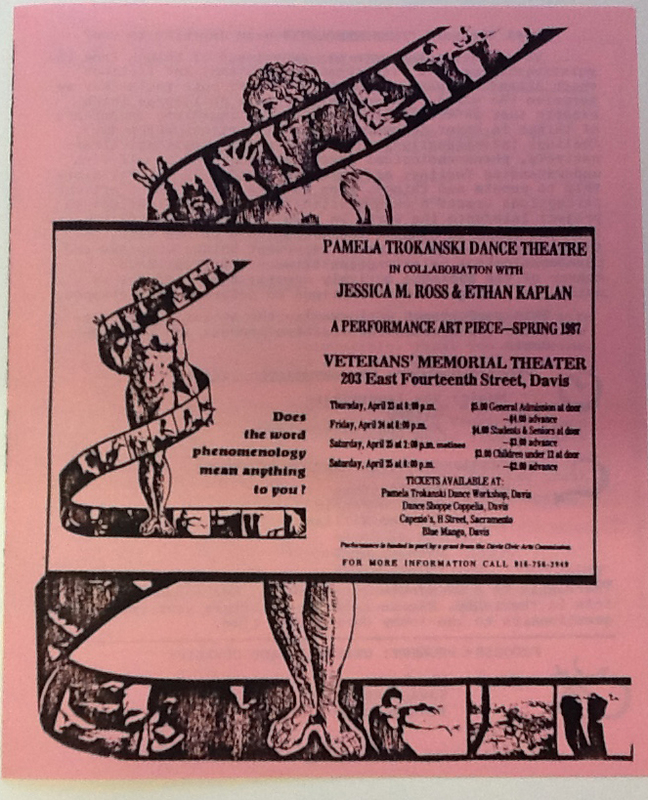 It was the Spring of 1987 and it was my first experience in integrating dance and video technology (other than the traditional recording of concerts)… It was a collaboration with Jessica Ross and Ethan Kaplan, both video artists. Dancers were Catherine Blais, Rachel Brandes, Lara Franklin, Gayle Kyhos, Andrea Needle, Noel Sturm and myself. It was my first thematically full evening piece in Davis, although I had done a couple earlier works in Rochester, New York (Tribal Rites of a Friday Night comes to mind… that would have been around 1983). Phenomenology was centered around the creative process and how each individual brings to the experience their own unique perspective, making every work of art a unique experience for each beholder. The process involved Jessica and Ethan shooting video of the company during rehearsals and mixing that with a diverse range of non-dance images. As I recall, each of the three sections were choreographed to a different version of Louie, Louie a song which was popular while I was growing up. I used the different versions of that song to give an example of how different people might have a different perspective on a work of art (Louie, Louie) While I did the majority of the choreography, dancer Catherine Blais was responsible was for the section set to music by Savage Republic and dancers contributed valuable input to the last two sections. The photos tell a great deal of the story… It was interesting to choreograph around the video monitors that were a part of the set design. Dancers Lara and Gayle during a rehearsal in the old studio at 911 Third Street.